Who doesn’t like a dungeon? (Quiet at the back…). We’ve already had the dragon so we may as well complete the set. Episode three takes the party back to the raider’s camp, following the assumption that they ever left it. If they did go back to town, they’re encouraged to return. Like episode one, where it was all about getting to the keep, then all about getting back out. Now, I don’t mind a bit of linearity in adventures, I’d even argue it’s necessary, but back and forth on the line and even I get a little motion sickness. The dungeon is just off the last site, and it’s got the local Cult leadership holed up in there watching over some soon to hatch dragon eggs. The ever minion like kobolds have gotten busy and trapped the place to kingdom come too. Traps are a funny old beast. D20 games never quite seem to know what to do with them. They play havoc with party roles and encounter balance. Should they be used as monsters, as locations, as hazards, or as a mix of all three? Hoard takes the old school route. The traps are there to be found with either player skill (I swear, a 10′ pole gets a straight faced call out), or character readiness (passive perception is never mentioned. Must have been out of the playtest at that point). Failure to spot them equals old fashioned hit point damage. The dungeon itself is ok actually. I like the layout, the tone, and some details are painted in at last. 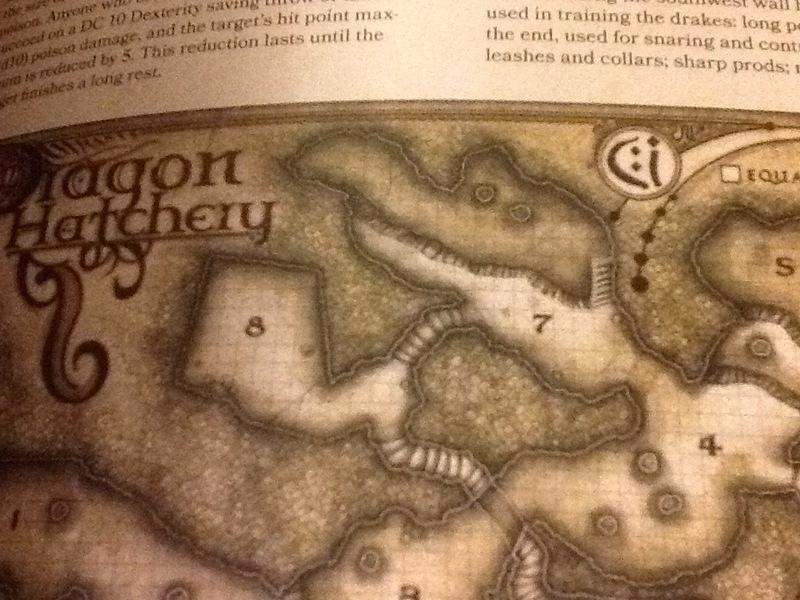 Is it just me or does this bit of the map not look entirely unlike a grinning Kobold? One big detail is revealed and then discarded without ceremony though. The baddie foreshadowed in episode one is encountered in her lair. The by now fabled (but only to the confused DM) Frulam Mondath is found, sighted and likely dispatched without so much as a by your leave. She gets no monologue, no description, no agenda, no character. I predict she will be part of this campaign for no more than 3 combat rounds. Crazy. Look, I’m not expecting Pathfinder levels of NPC background here. They tend to go massively overboard. In their hands, this NPC would have had a family tree, an inside leg measurement and copies of her last ten shopping lists. But there has to be a middle ground between the two extremes. What I’d love but oh so rarely get from villains statted out in adventures are some pithy one liners to toss out on their actions. Not like Dr Doom or Ultron, but something to give them some life you know? Here’s a suggestion: NPC components, verbal, somatic and material. What they sound like, what they do, and what they look like. Give me something to tell my players! Sorry. The dungeon. Yeah, it’s ok, good enough, and it has some traditional activities therein. Great review so far, and helping me as I prepare to embark next game night. I like your one liners idea. That is odd about the lack of passive perception, and I guess is one more sign of it being developed alongside the rules. Gotta accept some of that unfortunately. I hope that in the future, publisher adopt a shortened monster stat like your previous post, because as of now I literally have to reference the Hoard book, the Basic Rules DM section, and the online extra – three separate sources for the monsters in the adventure! Once the monster manual is out, this won;t be an issue, but WOW what a pain. I think I will print out and consolidate the Basic monsters with the online extra monsters since I have a copy of the boud basic rules floating around anyhow. Oops just babbling at this point – please continue your read through! I like the one liner idea. I like to express NPC’s individuality through combat, so I stat them with “on a hit” and “on a miss”. For example, when you hit a mad cleric it’s because he was fervently praying instead of dodging. When you miss a monk it’s because he stands there, just watching you — then when you strike he’s already moved.